Direct Line has been an innovator in the insurance market ever since they launched. Their rapid approval put them front of mind with the UK public for decades. But how do you reconnect the brand with an audience who are accustomed to rapid decisions and expect it? We created a concept for a platform termed #directfix and brought to life a real-time response to fix problems that existed in neighbourhoods. 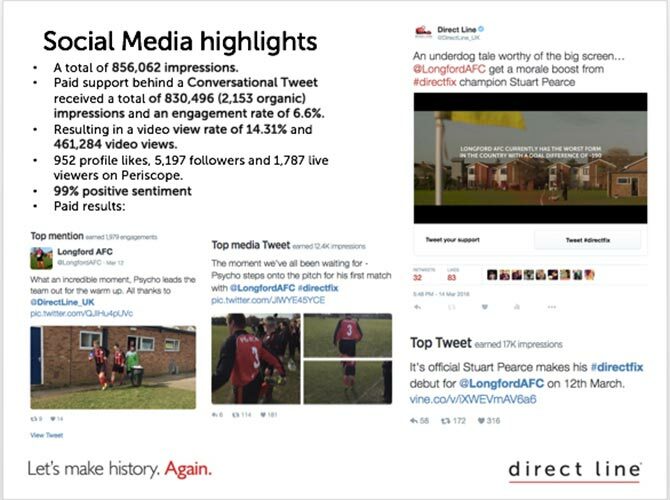 To successfully launch this campaign recognised the need for a piece of content that people would actively seek out and watch. So, we found a problem in the nation’s worst football team: Longford AFC, a team with a goal difference of -190. 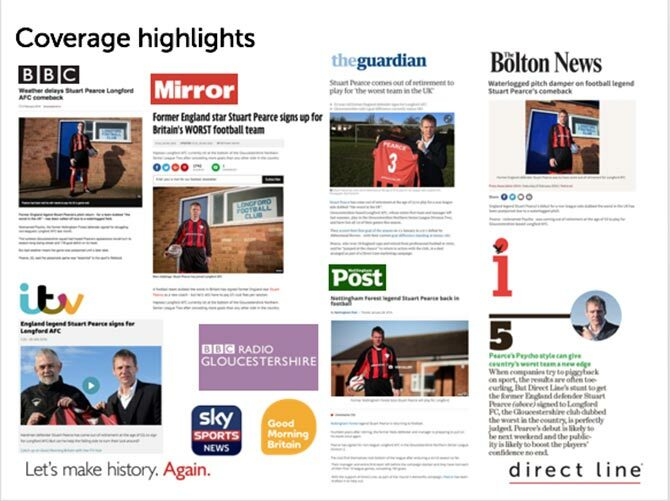 To ‘direct fix’ this we brought England footballer Stuart Pearce out of retirement to play for the team. 5,586,165 WEF impressions, an average organic rate of 3%. 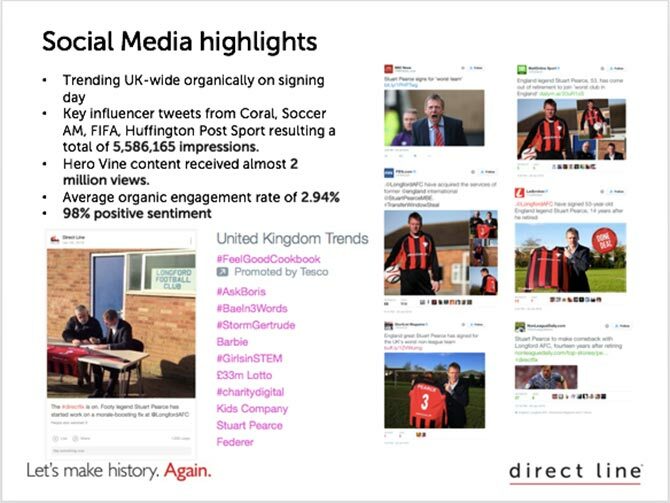 And the campaign trended UK-wide on the day when we ‘signed’ Stuart Pearce with social receiving 99% positive sentiment. The only result that didn’t speak for itself was Longford AFC: it still lost, but by one goal this time. By combining the power of storytelling through a range of earned and paid social media we were able to launch a campaign that was memorable, talked about, and entered the news cycle for that week. 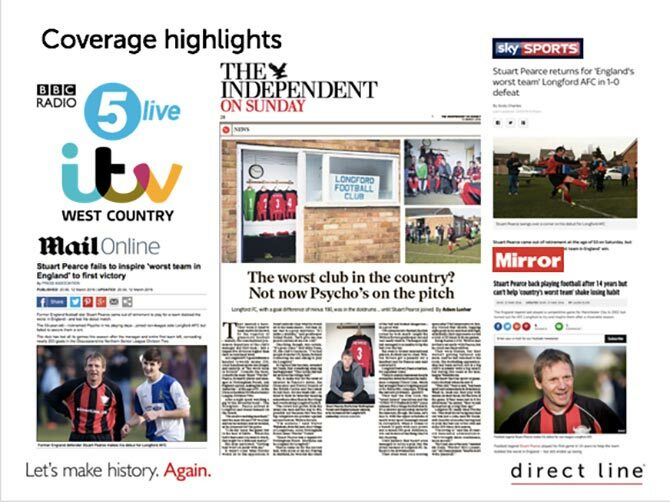 The story got a fair bit of media coverage.